It probably goes without saying how much of a crapshoot music can be sometimes, but it’s worth reminding ourselves every so often just so we don’t take great records and great careers for granted, because there’s no guarantee any of it will ever work out. In fact sometimes it’s a wonder that any of it turns out as good as it does because even when a gifted singer is paired with a first rate band on an experienced label the results don’t always live up to expectations. Not that anybody had big expectations yet for Mabel Smith, a twenty-three year old powerhouse singer with just one recorded vocal under her ample belt when she was signed to King Records in the fall of 1947. Surely they thought she was capable of delivering something noteworthy, as evidenced by teaming her up with some of the best and most experienced musicians they had at their disposal over the course of three sessions in November and December of that year. Yet the results, not to let the cat out of the bag or anything, didn’t do much for her career, which floundered in the abyss after these sides were released to no response. It’d be five full years before she’d get another chance in a studio. Since we know in hindsight that Mabel Smith would go on to become Big Maybelle and would have a long and rewarding career spanning two decades as perhaps the best all-around female rock vocalist in the pre-Aretha Franklin era, the question surrounding her underwhelming initial efforts (commercially and presumably aesthetically if no company was willing to give her another shot) therefore becomes – WHY? The examination of an artist’s early career is often a surrealistic experience. It’s not every artist who has a fully formed style right from the word go and when going back and following their path from inexperienced novice who is prone to trying out different approaches to finally becoming an established performer with a firm grip on their style is often very enlightening. In this case what’s enlightening has little to do with Maybelle herself (as we’ll refer to her as for the sake of career continuity), and more to do with King Records who, like on the top side, seem to have no idea of how to best position her for success, thus making her earliest forays on record a frustrating experience. Frustrating now for us in the future who know what this woman was capable of and want to hear her display that as often as possible. But also surely frustrating for Maybelle herself who is forced to watch her shot at the big time slip away without much of a fight. Not surprisingly for a first time artist entering the studio King Records had no firm destination in mind on the material they were cutting. On Sad And Disappointed Jill it was a case of too many conflicting ideas thrown into the mix, each one hoping to catch the ear of that particular constituency and in the process draw her closer to a specific market. All it did was pull her in too many different directions at once, satisfying no one, despite her voice and delivery being far more polished than most inexperienced artists. For Bad Dream Blues the problem is a different one. They’ve chosen a destination this time out – that of a torch song – a tricky style that she’s more than capable of handling. But it’s not a style that has much chance for the kind of commercial reception she – and they – need to get her off the ground, which makes it a rather strange choice for her debut release. I suppose that they figured she could prove her chops on this and since it was a B-side its commercial potential, or lack thereof, wouldn’t be an issue. It’d be giving her artistic credibility and that in of itself was worth something. But while she doesn’t falter in her role the song itself shakes out to be nothing more than a… bland outing (you thought I was going to say “bad dream”, didn’t you? Sorry, I’m not that obvious). Hot Lips Page’s trumpet squawks through an intro that sets up our disappointment going forward. Though played well enough and reasonably appropriate for the song’s lyrical content, it’s already an anachronistic sound, one that in the rock setting is not particularly gripping, already at risk for letting the audience lose interest. A torch song’s effectiveness centers around getting the listener on the side of the artist, of pulling them into the story in a way that makes you want to hear their tale of woe and ultimately to sympathize with their plight. But it can be a tough thing to pull off because sympathy is not the most endearing quality for an artist to be seeking from their listeners. Maybelle herself understands her role and pulls it off as best she can, pouring on the misery for the slow drawn out verses. She’s such a powerful vocalist that even when she’s easing back on the volume as she does for most of this she can still suggest plenty emotional angst, but the problem is that the pace leading up to this has put you to sleep. It’s certainly not helped by the backing in that regard. The guitar solo by country bluesman Lonnie Johnson may be expertly delivered from a technical standpoint, but as backed by a halting piano it makes even that part of the performance seem more languid than it actually is, further lulling you into a sense of drowsiness. Johnson’s solo at least leads into the best aspect of the record, the stop-time bridge that Maybelle conveys with increasing grit which at least provides some contrast to the sluggishness of the rest of the song, but your mind has already wandered and in this musical style that’s an insurmountable obstacle. Each individual part might indeed be carried out with class and grace, but they combine to make for a boring record, something that is magnified by the lyrical topic which is the song’s fatal flaw. The story of Bad Dream Blues is about waking up from a disturbing thought, in this case Maybelle imagining her man with somebody else. But by definition that becomes a red herring, a plot device that is admittedly not real – even in the story for the lead character herself it’s merely an underlying fear, not a tangible event – and so there can be no real emotional attachment to what she’s telling you. I hope it doesn’t rain tomorrow isn’t the same as getting wet. Being worried about your significant other finding a more significant other (…than you) might be a realistic fear in principle but that worry alone has got absolutely no consequences unto itself. Further hampering the song’s effectiveness is the fact that we don’t know these people, we have no sense of them, their relationship, their history. We don’t hear a thing about his behavior that might’ve tipped her off that something was amiss, we don’t find out about any whispered rumors of another female on the make for her fella. There’s nothing to set the scene, we’re just dropped into the middle of the story… of HER dream… and expected to share in her concerns as if they were our own. As a story construct it doesn’t work because there’s no set up for the payoff (there is no payoff by the way, the final death blow to it succeeding) to have an impact. It also doesn’t work as a way to elicit the actual sympathy required for it connect, because as anyone who’s ever been unfortunate enough to suffer through somebody else telling you of their dreams knows, there’s few things in life that are worse than hearing about something that never actually happened from someone who is acting as if it did… and expecting YOU to react accordingly. I suppose the sleepy nocturnal musical atmosphere they wrap it in is entirely appropriate for the theme. The creeping pace, the instrumental flourishes, Maybelle’s own barely awake sensibilities fit right in with the lyrics. Yet if we don’t care about what those lyrics are telling us then all of the other attributes it may possess won’t make a bit of difference in our appreciation of it. It’s hard knowing what they were aiming at with Maybelle and I don’t think THEY really knew either. They seemed to throw anything and everything at her style-wise because they sensed she could deliver the appropriate performance for them all. Alright, she can, we know that. But it’s just that what they gave her wasn’t strong enough on its own to be rescued by her sheer vocal ability or the band’s instrumental skills. Bad Dream Blues is a case of badly misjudging the emotional connection between the listener and a novice singer without any track record even for an audience to feel some kinship towards going into the song. It can’t work – not because of Maybelle or anyone on the record, but because of the song they were asked to impart. The answer to why succeeding in music is so difficult is pretty easy to see when studying this record in particular – for even when you have most of the right components for it to work, a great singer, a solid band and a label with the ability to produce and promote it, all it takes is one area that falls short to send it to deserved oblivion. 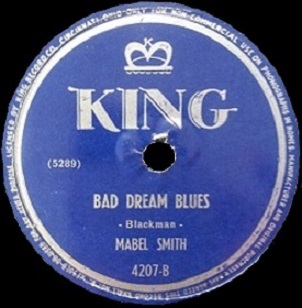 Leave a reply on "Big Maybelle (as Mabel Smith): “Bad Dream Blues”"